Are the Druze descendants of the Zebulun tribe? The answer is yes! according to the interview published in the Israel News newspaper on October 10, 2010 by Knesset Representative of Israel, Druze MK Ayoub Kara (Likud). “All our prophets are Jewish ones – Moses, Judah, Jethro, and Zevulun, the son of Jacob.” In fact, he says, the Druze are likely one of the lost tribes of the Jewish people – probably Zevulun, considering his special status among them. Ayoub Kara explains that for the Druze to survive the sword of Islam and persecutions of Christianity, the Druze had to become a secretive group of people, adapting to Islam, or Christianity as the times call for, so they could continue to live. The Druze is a secret religion and it is very hard to find the facts that corroborate what Kara is telling us…They concealed and disguised their beliefs not only to survive, but also to protect themselves and their brethren in Lebanon, Syria, Israel and a total of about 1,000,000- 2,500,000 scattered around the whole world. not to be confused with the Magen Red star of David that is a six point star and the Druze used it in their burials, business, homes etc., according to Knesset member Ayoub Kara. 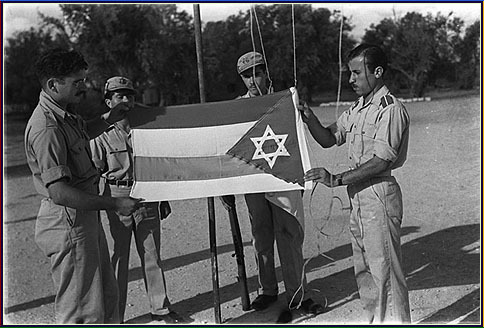 “During my surfing in Hebrew sites I found a black and white picture showing the flag of the Israel Defence Forces (IDF) Druze soldiers in 1948. The picture is in the Druze page at Snunit site which is the Jerusalem University site. The flag has four horizontal stripes and a triangle with a Magen David on it. I saw the real IDF flag and the order of stripes is the same as the regular Druze flag (red-yellow-blue-white with a white Magen David on the green hoist triangle). The Druze consider their faith to be a new interpretation of the three monotheistic religions: Judaism, Christianity and Islam. For them, the traditional story of the Creation is a parable, which describes Adam not as the first human being, but as the first person to believe in one god. Since then, the idea of monotheism has been disseminated by “emissaries” or prophets, guided by “mentors” who embody the spirit of monotheism. The mentors and prophets come from all three religions, and include Jethro and Moses, John the Baptist and Jesus of Nazareth, and Salman the Persian and Mohammed – all reincarnations of the same monotheistic idea. In addition, the Druze hold other influential people – regardless of their religion – in great esteem, as the advocates of justice and belief in one god. These include the Egyptian Akhenaton, the Greek philosophers Socrates, Plato and Aristotle, and Alexander the Great. The Druze have an annual festival where they visit the tomb of Sabalan, But who is Sabalan? Sabalan was a Druze prophet, believed to be either Zebulun, the sixth son of the Patriarch Jacob, or one of the emissaries who propagated the Druze religion in the eleventh century. Sabalan’s tomb is located above the Druze village of Hurfeish (see Druze towns and villages). It is the site of an annual festive pilgrimage and is visited throughout the year by those who have taken a vow to do so…. The village of Hurfeish is in Israel, situated on the road that runs east from the coastal town of Nahariya, and the site of the tomb of the important prophet Sablan. On September 10th each year, Druze come to celebrate his festival in the village. In 1972, a monument was erected in Hurfeish in memory of Druze soldiers who fell serving with the Israel Defense Forces. Druze only marry Druze within the same village or the same geographical area, they do not allow “new converts” into the religion, thus remaining genetically isolated…They claim to have been founded by different groups about the year 1000 AD, but since then no one outside has been allowed into their group. But we also find among the Druze in smaller numbers: haplogroup “L” and haplogroup “G”. And we do not know the Torah blessings that they have in their paternal genealogy. L was found in 51% of Syrians from Al-Raqqah, a northern Syrian city in which its previous inhabitants have been wiped out by the Mongols by and repopulated in recent times by local Bedouin populations and Chechen war refugees. In a small sample of Israeli Druze (35%). However, studies done on bigger samples showed that L-M20 averages 5% in Israeli Druze, 8% in Lebanese Druze,and it was not found in a sample of 59 Syrian Druze. Haplogroup L has been found in 2.0% (1/50) to 5.25% (48/914) of Lebanese. Y-Haplogroup G in the Levant. Other groups with a significant G frequency include Catalan-speaking northern Sardinians and the Druze, who are about 18% G2a. Is one of these two Y- haplogroups Zebulun? We have one L and one G in Etz Yoseph. We appreciate information on the subject of Y-Haplogroups L, G, Zebulun and the Druze, so we can continue in the quest of trying to identify the 12 Tribes of Israel. Brachot Ahavta Yeshua! Blessings in the Love of Yeshua!